Type: BOOKS. Detail: Crouch, C. Product Code: 9781857446708. Leading chess author Colin Crouch believes that the key to sustained chess improvement lies in the critical analysis and assessment of your own games. Each and every game you play provides a significant learning opportunity, and this opportunity should never be squandered.In this sequel to his highly acclaimed Why We Lose at Chess, Crouch examines what we should do to maximize our chess results and ratings, how to turn losses into draws, and draws into wins. Here he focuses on major issues such as improving decision making, how to plan after the opening, how to maintain objectivity, improving endgame skills, the psychological aspects of the game, and much more. 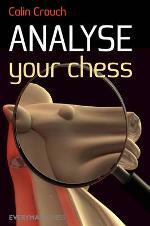 Read this book, analyse your chess, and get ready to improve your results!